What a winter! Middle-Easterners are protesting their terrible governmental overseers. State workers are protesting the union-busters. The Republicans are protesting the Democrats, and the Democrats are protesting on general principles. Closer to home, my horses are engaged in a massive protest of their own. They're sick of being cooped up on stormy nights and sick of being outside in the storm. They hate their feed and the lack thereof when they've left it in their buckets. They've made a sculpture of the hay in the feeder, having flung it into the air and watched it fall in interesting piles that only the one-eyed horse will actually eat. They walk into the barn on tiptoes and stand in front of me, one at a time, staring hard, willing me to pop the snow balls out of their feet so they can go back to running and bucking and landing flat-out with abandon. They're pissed when they come for dinner dressed in icicles and equally pissed when the sun comes out, though they're not saying why. And I'm right in there with them. So what does a horse person do with horses in the yard when they can't be ridden and don't show much interest in RFDTV on the newly-installed flat screen in the barn aisle? She teaches them tricks! What else? Zip did, eventually, learn to arrange the cones in the ring to suit his own training preference, and Lauren went on to a normal life without horses or clickers. My congrats to both of them. So I'm thinking this is a good time for a refresher lesson on clicker training. Those of you who have been following my blog for some time will recognize the photo. It's the only one I have of someone actually performing the clicker process. And there's nothing really new in the world of clicker training. But I'm revisiting this topic because it's been such a crappy weather season, and I know there are people besides me who lost the will to live about two weeks into the first round of ice storms. This is for you. Clicker training couldn't be easier, and the best part is that the early stages are barn-worthy, not requiring that Trainer or Trainee venture into the snow and ice or floods and mud. Clickers are easy to find at the pet store since dogs were subjected to clickering long before anyone bored enough to consider it wisdom thought, "Hey! Let's see if my horse can fetch a ball!" Clicker in hand? Dress for success (and the weather), and off to the barn you go! Start with the horse you think is least likely to attack you, fall over dead from stress at the sound of the clicker, or fall asleep. Put him in his stall with a stall guard or stall gate or half-door closed to prevent his leaving or moving around so much that you spend the next hour chasing him. His head and neck should be free and unencumbered, eg: no halter or neck collar or small child clinging to any of his upper parts. This second photo shows a good arrangement for a starter session. Leo can hardly wait. Next, you'll need the all-important Phase One Target. Anything handy will work, but try to keep it simple. If the target is more interesting to the horse than you are, then you've lost a teachable moment and gained a circus act. Has your horse heard the sound of a clicker before? How about the other horses in the barn? If any of the resident animals is a clicker virgin, I suggest you start outside the barn, clicking like mad as you calmly walk through the door. Watch for negative reactions. A horse (Pokey comes to mind) doing an Olga Korbut over the stall guard is a definite negative. If no one panics and your chosen trainee appears mildly interested, you're well on your way. 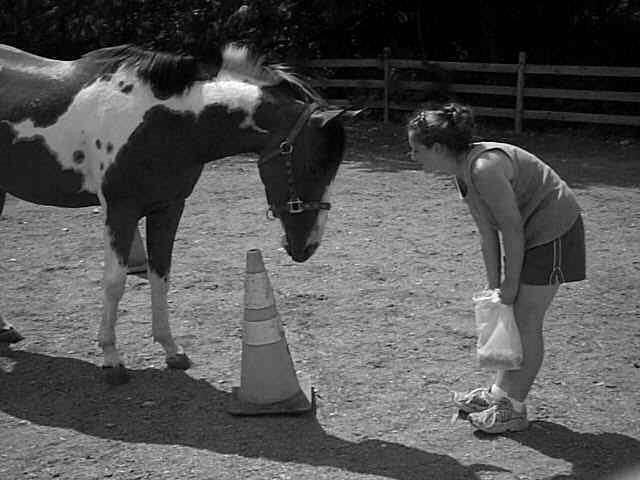 Stand in front of the horse, far enough away to make frisking you for cookies an impossibility, but close enough so that you can easily put the target within nose range. Put the target within nose range. Now. Hold it out in front of the horse and wait. Is he touching it? If not, you haven't waited long enough. This whole clicker thing depends heavily on "catching" the horse doing the right thing. He can tap dance, chew the wall, slam his bucket, spit at you....you don't get to react at all unless he touches the target (let's guess you went to Wal Mart or Advance Auto Parts and bought a package of those little orange plastic cones) with his nose. The instant--the very instant-- he does, click that clicker and hand over your chosen treat. Squelch the desire to yell and jump up and down. Just click-treat. I like tiny miniature frosted shredded wheat for this because they go down really fast and are unlikely to result in a choke episode and emergency vet call. If it takes him ten minutes to chew and swallow what you've given him, he's already forgotten why he got it before he's finished eating it. This is Day One, so all you're going to do is work on making the target-touching as snappy and clean as possible. It might take a few minutes if the horse has been subjected to other trick-training efforts and catches on quickly. It might take hours if the horse (Dakota) is startled every time you click the clicker. Just keep at it until you're satisfied that the horse has made the connection between the target and the click-treat phenomenon, then call it a day. Your toes are cold anyway, so why press your luck? You will likely find that the other horses who were watching also picked up the lesson. This is truly awesome. Tomorrow, when you move on to the next step, try a different horse for a minute and see if there hasn't been some unexpected learning going on. Hurrah for science and viva l'experiment! Did someone you love just announce that they’ve bought a horse? Did you fall in love with a horse person before you realized what that meant? Have courage! All is not lost. There are ways for a non-horse person to enjoy life with a horsy type with minimal bloodshed. Most non-horse people find it very difficult to understand why anyone gets into horses. The animals are large, tend to smell strongly, require endless attention and care, and all equestrian sports require huge outlays of cash for equipment, transportation, and in service to that Fashion Forward look. 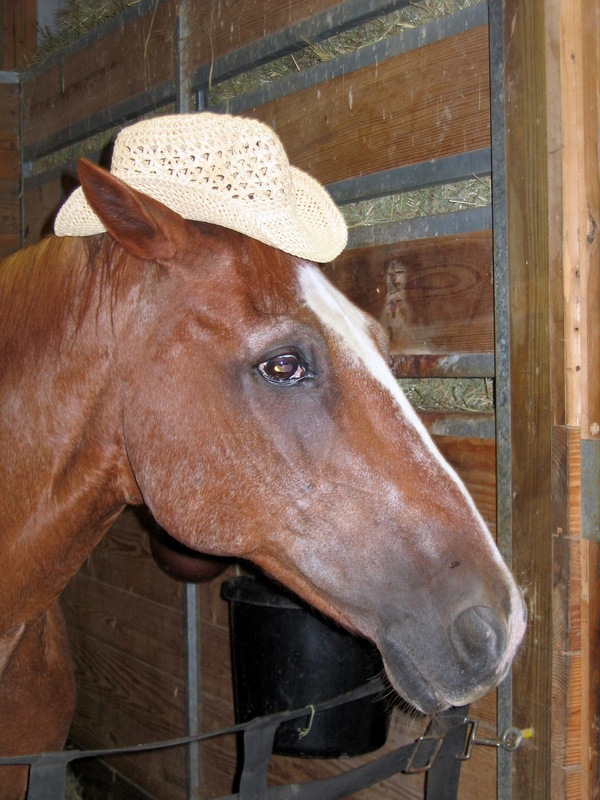 In addition, horse people can be very single-minded and self-centered. It has been bandied about (even right here in my own home) that horse people should all be kept together out of range of non-horse people for the sake of everyone’s sanity. I don’t think that’s entirely necessary. It is, however, vital that non-horse partners find a way to communicate with and enjoy life with the horse people into whose scary world they’ve wandered. First, be sure you’ve hooked up with a real horse person. Some people simply like horses. They like to look at photos of them or watch them go by in parades. That doesn’t make them horse people. If you have managed to find a horse liker as opposed to a horse lover, you’re in luck. You’ll only need to attend an occasional horse-related event or verbalize appreciatively when horses appear in a movie or TV commercial. If you’re sure you’ve got a full-blown horse addict on your hands, you are going to have to make some adjustments, but don’t feel that the full burden is on you. Horse people, under duress, can adjust as well, just not quickly. Pretending to love your partner’s horse is not a good place to start. If you’ve never been completely obsessed by anything, you can’t appreciate what it means to love a horse. Your partner may immediately assign you to some sort of horse duty—standing foal watch, stall-mucking, waiting for the vet or shoer and standing around while they minister to the animal—believing that you are happy to have the chance to be involved with Darlin Daisy’s care. There are horse lovers in this world who can’t afford a horse or have no place to store one, and they do tend to flock around horse owners just begging for a sniff of leather or the feel of a soft nose. If your partner puts you in that category based on a lie, you’re done for. Even worse, if your partner has, as many horse people do, a lot of money and little common sense, you may find yourself (as did my own partner) owning a horse and being expected to ride it. Unless this is part of your game plan, be honest and up-front about how you really feel about Daisy and her kin. Better to lose your lover than wind up stuck in a world you never meant to join. Before you panic and break off your relationship (or disown your child, as the case may be), there are good things about horse people, and with the right attitude you can take advantage of the situation without serious damage to your mental or physical health. For one thing, barns are often really nice places to hang around. They tend to be quiet. 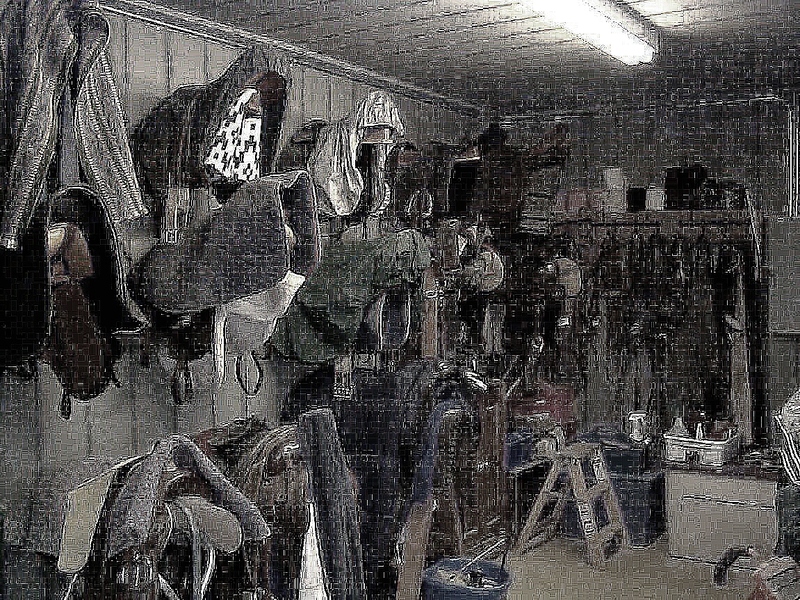 A barn full of horses is a nice place to be on a rainy day. There’s something soothing about a bunch of animals softly chewing hay while rain beats down on the roof. Bring along a comfy folding chair and a book, and you might find that you’ve got a new favorite hiding place. All-steel barns are really poor places for cell phone reception, which makes “I was in the barn” a viable excuse for missing all sorts of unpleasant events and chores. No horse owner will ever find fault with that excuse for anything short of the birth of your child or a parent’s funeral. Non-horse person finding his path: SUCCESS! Horses are actually nice animals. 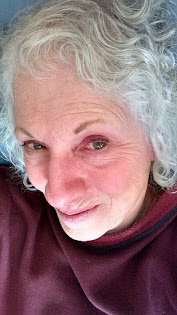 They are kind and forgiving, and they have a sort of sixth sense that makes them willing listeners when you’re feeling stressed and over-burdened. You can spend time talking to Daisy, which will make your partner happy and might help you find Enlightenment. One never knows. Horse people can be a lot of fun to be around. They tend to have outrageous senses of humor. They also tend to be willing workers. If you need help with something around the house, just mention it at the boarding barn. You may find yourself with more help than you could have rounded up on your best day at the office. Horse people are often a little hyper but generally enthusiastic. Just don’t expect the job to be done the way you’d planned or that they’ll all agree and get along famously while the project is afoot. Alcohol and cookies can smooth over the rough patches. Your partner will probably be the most independent person in your life. If you’re male, you may find that you’ve hooked up with a female who is more mechanically inclined than any of your male friends. The counter man at the local tractor parts store once told me that he can tell a horse woman as soon as she enters the building because she’ll have a ruined part in her hand and know exactly what it is, what’s wrong with it, and how to replace it. Don’t expect her to be an outstanding cook as well. She may spend more time cleaning the barn than the house. Learn to clean while she fixes your car. If you’re a non-horse woman paired with a horseman, expect that he’ll do eight things at once, and only the horse-related projects will reach completion in a reasonable amount of time. But he’ll be honest about his addiction and will have energy to spare. I’ve never met a bored horseman. They are always busy with something, and you can put that tendency to good use around the house. Don’t give him a list; he’ll use it to wipe saddle soap off his conchos. You will rank lower than his horse, but after all, you can take care of yourself, and he’ll expect you to. I suppose it shouldn’t surprise anyone that horse enthusiasts would eventually point their big guns at each other in their desperation to solve the overpopulation problem in the horse world. 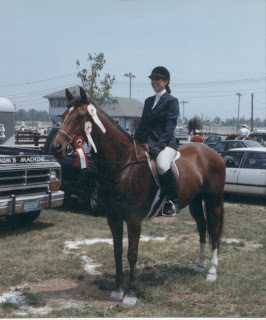 But the recent article in The Horse (“In Defense of Grade Horses”, Marla Trowbridge, MS) really torqued my britches. The author did a terrific job, but what putzes we are! Seriously? Is there a mindset that actually singles out grade horse production for the overabundance of equines? That has to be one of the worst examples of elitism I’ve come across since the not-long-defunct days when folks went around putting quarters on white spots on Quarter Horses to see if they qualified as “too colored” for registration. I know for a fact that that debate still rages on behind closed doors across the land. One might even conjecture that a complete and myopic focus on breeding for “desirable” traits just might put an end to the problem once and for all. Eventually we’ll create horses that can’t stand up, can’t eat, can’t move properly, and can’t reproduce. What a boon for us all! Nope, I can't even tell you...and he was ours. If you haven’t read any of the groundbreaking work by Temple Grandin, now would be a great time to pick up a copy of Genetics and the Behavior of Domestic Animals. We have spent generations ruining perfectly good critters with our insistence that we “need” bigger, faster, fatter, thinner, more prolific, less prolific, smarter, dumber, prettier, brighter-colored or whatever added to the genetic soup that came with the original blueprint. Always anxious for an upgrade, we can’t stop making the world conform to our whims, many of which are fads that die out before the changes we’ve made have a chance to prove us wrong. And we never quite seem to get that within the limits of reality, if you get a bigger this, you’re going to have to put up with a smaller or less-functional that. So, where is the fault to be placed if not in the production of “grade” (meaning not qualified for a breed registry) horses that have mostly been bred to suit a particular need, sturdiness being the most common? We’ve already targeted all those breed-savvy folks who insist that a foal with too much of this or not enough of that isn’t “suitable” and so lands in the Disposable pile. We’ve attacked the backyard breeders, especially the accidental ones who allow someone’s intact boy horse to come into surprising contact with an interested girl horse. We’ve taken on the competitors whose horses become disposable when they cease to be competitive. The poor disadvantaged and horse-illiterate owners who have given up horses they can't afford (and might not ever have been able to afford) or don't know how to care for have felt the sting. We haven’t quite had the guts to point at the horses being kept alive well beyond their own desire to continue simply because some human can’t quite make that Final Decision. I won’t even mention the race industry as they’re too busy licking their wounds to read this anyway. 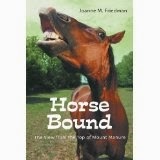 And without a doubt, residential jurisdictions that require breeding for continued recognition as "farming" horses--the ones that won't allow buying and reselling or simply pasturing and maintaining the beasts, as if they turn into hamsters if they're not sexually active--are among the biggest culprits. Even the judges questioned what my mare was. Ms Trowbridge has done a fine job of shining a bright light on our silliness. You want to add a target to your wall, add anyone who refuses to consider any type of horse as suitable simply based on a nonsensical bias. Holster that pointer finger and take a good, objective look. Read up on genetics and our role in the biggest failures, and do whatever comes next in your small part of the horse world to help us all past this huge hurdle and back to a sane approach to animal husbandry. You may not be thanked now, but you’ll get your white hat when the time is ripe.